Clarksville, TN – Austin Peay State University and the APSU College of Science, Technology, Engineering and Mathematics (STEM) recently celebrated women in STEM by launching a high-altitude balloon carrying two dolls adorned in American Girl NASA space suits. The dolls reached 93,914 feet at 11:13am January 24th, 2019. Balloon project team members hoped the launch helped raise awareness about the challenges of women rising in their fields of study. “While growing up, I never really thought of myself as being good at mathematics or physics, the really difficult STEM fields, but being able to do this and having a successful launch, being the lead on it, having that responsibility, it feels good,” Megan McCracken, team leader for the High-Altitude Balloon Team, said. McCracken is pursuing a degree in physics after earning a master’s in genetics and parasitology. Her goal is to become a professor, educating the next generation of scientists. The APSU High-Altitude Balloon team members secured two dolls – dressed in American Girl doll NASA space suit provided by the College of STEAM – to the balloon payload. They affixed two GoPro cameras to the load to capture the dolls at the edge of space. American Girl and NASA designed the suit for the company’s 2018 girl of the year, Luciana Vega, a doll whose storyline includes the “creativity, confidence and a serious science streak” to reach for the stars with a dream of landing on Mars. 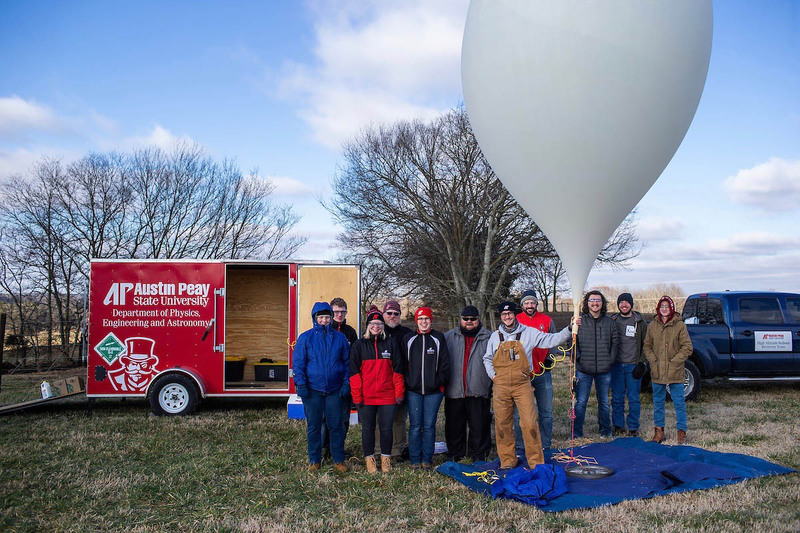 The team launched the balloon at 9:52am January 24th from the Austin Peay Farm and Environmental Education Center on Pickens Road in Clarksville. The balloon rose steadily at 5-9 meters per second (11-20 mph) and drifted northeast over Port Royal and Adams, Tennessee, before crossing into Kentucky and over Adairville, Franklin and Glasgow. A parachute carried the payload back to the Earth at about the same speed it went up, and the dolls landed without damage in a field about 115 miles away near Edmonton, Kentucky, at 11:45am. A recovery team tracked the landing using GPS data and Google satellite photos, retrieving the dolls at 2:32pm (after stopping for lunch in Bowling Green, Kentucky). “At any given time, we have three or four projects we’re working on to go up for a launch, especially during 2017 for the eclipse,” McCracken said. The team launched a balloon carrying a NASA camera used to air live footage during the August 21st, 2017, total solar eclipse. Generally, the team launches two balloons each semester. Several students helped with the doll launch, which carried the heaviest payload the team has ever had, weighing in at 11.6 pounds. The Federal Aviation Administration limits payloads to 12 pounds. The team normally uses 6-pound payloads. The team needed 2 ½ tanks of helium to provide 20 pounds of lift for the launch, also a record. Because the balloon had a heavy load this time, it didn’t reach as high as some other balloons the team has launched. The highest team balloon reached over 98,000 feet. The balloon payloads sometimes land in far-off places. The balloon-recovery team tracks the payload via GPS, usually leaving about an hour after the launch. “We’ve had three or four that have landed on private property,” McCracken said. “The last launch landed in a cow field, so we had to go up to the owners of the land and ask them if we could go out there. We were surrounded by cows. Bryan Gaither, lab manager for the Department of Physics, Engineering and Astronomy who helps the balloon team, said the team does everything it can to find landowners to get permission to retrieve the payload. 8:00am – High-Altitude Balloon Team starts prepping site for launch. 10:17am – Balloon hits 30,000 feet, traveling 24 feet per second. 10:40am – Balloon hits 60,000 feet, traveling 17 feet per second. 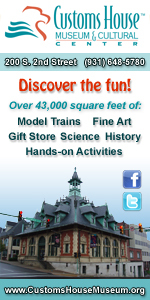 11:08am – Balloon hits 90,000 feet, traveling 17 feet per second. 11:13am – Balloon pops at 93,914 feet. 11:42am – Balloon payload lands in field near Edmonton, Kentucky. 2:32pm – High-Altitude Balloon Team retrieves payload. The team launched the balloon at 9:52am January 24th from the Austin Peay State University Farm and Environmental. For more information about the APSU College of STEM, visit www.apsu.edu/costem. For more about the APSU Department of Physics, Engineering and Astronomy, go to www.apsu.edu/physics. For more about the APSU Farm and Environmental Education Center, visit www.apsu.edu/agriculture/environmental-education-center.php.